Wild solace grows in these hedgerows. 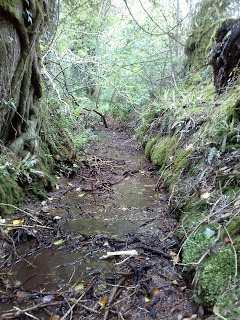 I follow the stream as a whimsical path. The drainage is manmade, a plastic tunnel channeled from the field. Dug over in the shale are old bones, old teeth, turned from the earth when the tunnel was dropped in. 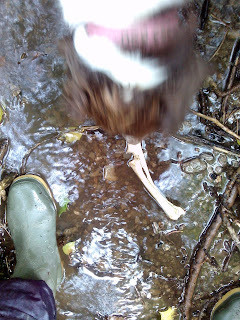 In the stream too, a bright skeletal relic: shiny clean in shallow water. I can't imagine these trees as saplings but they must have grown, out of the earth where the bones all lie. Water churning bones up between moss-bound banks. What a fascinating walk! And yes, I suppose we must remember what earth does not permit us to forget. Our planet, it thinks with things.